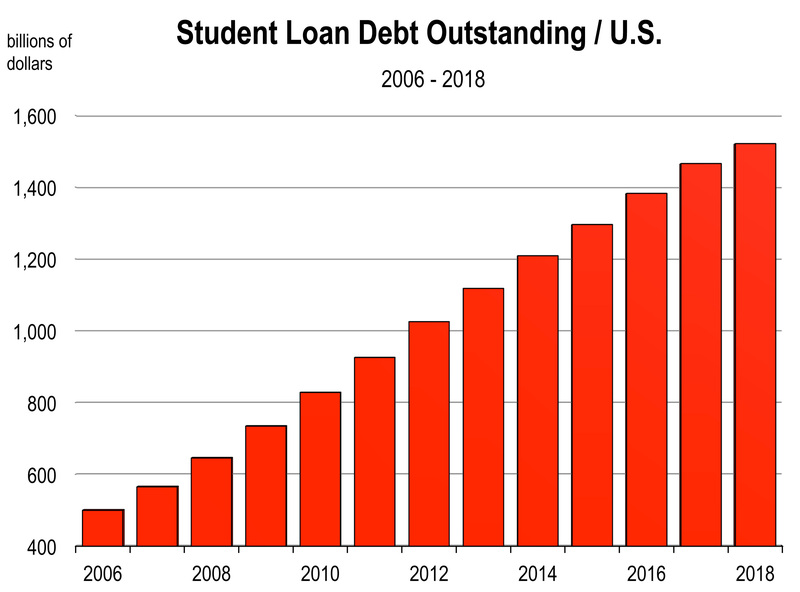 With over $1.5 trillion in loans outstanding, student debt is now the second-largest source of household debt (after mortgage debt) and is the only form of consumer debt that continued to grow during the aftermath of the Great Recession. The principal concern over the last few years has been the shear volume of student loan debt and the speed at which it is rising over time. Per graduating student, debt loads are non trivial, and are now at their highest levels ever measured. The average student loan burden for Class of 2017 graduates was $39,400, up 6 percent from the previous year. More than 44 million Americans today carry some student loan debt. Tuition costs have soared at colleges and universities. 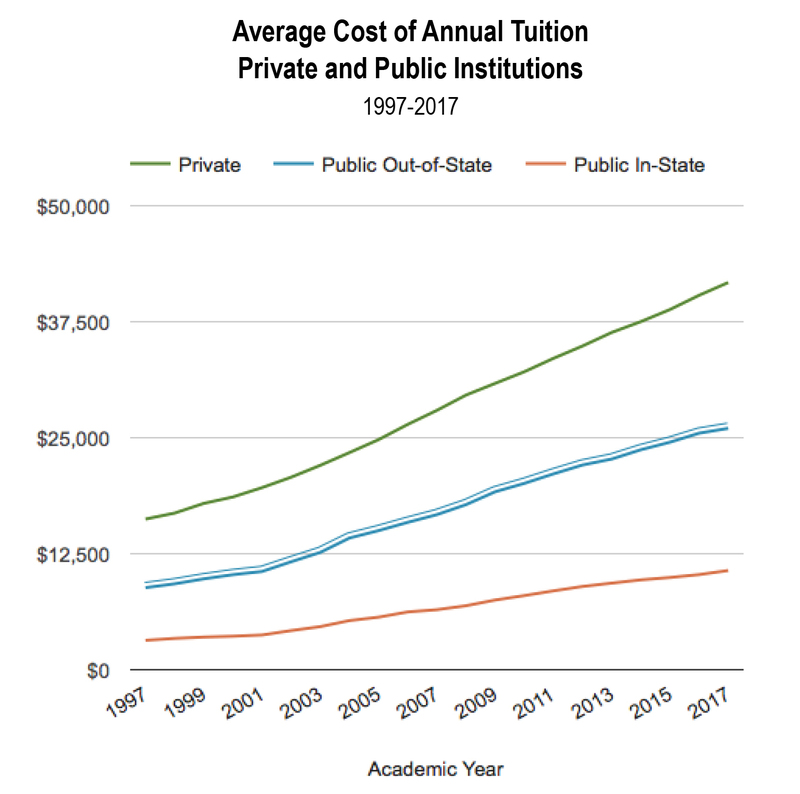 Between 1997 and 2017, in-state tuition at public universities jumped nearly 240 percent. During this same period, consumer price inflation increased 53 percent. Consequently, the cost of college and university tuition outpaced the general price level by 5 times. And relative to expected income, tuition has increased to between 25 and 40 percent of an adult’s median household income. Back in 1970, annual tuition represented between 7 and 20 percent of the annual median household income. The result is that student graduates owe a far greater amount today relative to their current and future incomes than the baby boomer generation who graduated from colleges in the 1970s and 1980s. Student loan payments average $351 per month for those who carry debt. If your starting salary after graduating from a 4 year university is $60,000 per year, those debt payments represent 9 percent of your monthly take-home income. Clearly, graduates earning less have a higher loan payback percentage of income, and this diverts household spending from private sector goods and services to federal loan repayment, an area of expenditure with a much lower, if any, economic multiplier. Interest rates on new student loans currently range from 5.05 to 7.6 percent.1 This makes student loans more expensive than paying a mortgage. And this is especially true for graduate students (and parents) who face the highest rates from Sallie Mae. Freshly minted lawyers and doctors can have student loan debt of $200,000 to $500,000, which is often larger than a mortgage. The size of student loan debt and its growth over time has previously been the focus of attention, but now a growing concern is the default rate among borrowers. New data show that delinquency rates on student loans may be going as high as 40 percent of borrowers by the year 2023. The default rate is already higher than anticipated for the particular student cohorts studied, so the federal government should be bracing for substantial non payment of debt. Currently 58.5 percent of all direct student loans are in repayment, and 41.5 percent are not. Regarding those that are not, 23 percent are in deferment or forbearance, meaning the repayment is temporarily suspended with or without interest, on the request of the borrower. Five percent are still in the grace period and 15 percent are in default. When a borrower defaults, he or she simply fails to pay interest or principal on a loan when due. So if the loan is federally insured, as most loans were up to mid-2010, then the Federal Government is on the hook. It’s the same thing as when the U.S. loans a few billion dollars to the Cayman Islands and they don’t pay it back. In fact, as of 2017, the Caymans owed the U.S. $302 billion. Canada owes the U.S. $380 billion. Neither of these countries is likely to default however, but countries have in the past like Mexico in 1994 and Argentina in 2001. And we can’t trace these defaults to an impact on our economy. Can students merely declare bankruptcy to avert paying back the loan? No. Student loan debt is virtually inescapable and is precluded from debts that are dischargeable in the U.S. bankruptcy code. Consequently, there are increasing stories online reporting how debt strapped former students are fleeing the country and hiding out from Sallie Mae and collection agencies. Is the Potential Flood of Defaulting Student Loans Another Looming Financial Crisis? Our lending systems generally work efficiently and borrowers don’t default on debt because lenders won’t make too many high risk loans. System risk rises when lenders extend unwarranted credit. This occurred during the housing bubble days of 2004-2007 when easy credit gave rise to massive home buying pushing selling values to record levels. A bubble “pops” when prices correct to more accurately represent the intrinsic value of the asset. Clearly, home prices towards and at the peak exceeded the true value of those homes. Prices corrected, borrowers owed more than the home was worth, and there were unprecedented numbers of defaults and lender bankruptcies. Loans ultimately became restricted and this slowed down the economy because businesses had difficulty obtaining capital needed to grow, invest, and hire. Is the current student loan debacle a bubble? And if so, when will it burst? I’ll address this in the upcoming July newsletter. 2 A GSE is a government-sponsored enterprise, or a financial services corporation created by Congress to enhance the flow of credit to particular economic activities such as agriculture, home finance, and education.